The industry promises to take many twists and turns next year. In 2015, the HIT industry faces more questions with seemingly fewer answers. How can it ensure that data exchange meets government regulations so that patient data are secured appropriately? What about meaningful use? Will mobile play an increasingly larger role in patient engagement initiatives? What does Cerner's acquisition of Siemens mean for the rest of the players? What new technologies will organizations seek to purchase and implement? "The federal government has invested $26 billion in interoperability, and many hospitals and doctor's offices have implemented EMRs but we still cannot get the right data points out at the right time to help care for patients," says Mitch Work, MPA, FHIMSS, president and CEO of The Work Group, who expects to see more mergers, acquisitions, and bankruptcies within the HIT industry. The reason? Many companies are selling into the marketplace, while federal money for meaningful use incentives has begun to dry up. In part, this has led to a growing contention between health care organizations and the federal government—in particular the Office of the National Coordinator for Health Information Technology—regarding meaningful use requirements and the difficulties surrounding stages 2 and 3. Some believe that pushback will become fiercer in 2015. 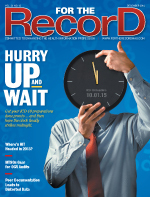 Pushback also may come from organizations struggling with the transition to ICD-10. It's one reason Devin Jopp, EdD, president and CEO of the Workgroup for Electronic Data Interchange (WEDI), points to regulatory drivers as one of his association's major 2015 objectives as it works to ensure systems and providers are ready to implement the new codes come October 1. WEDI, which sets the standards around data points on health insurance cards, also is planning a 2015 pilot to expand its HIT card implementation program. It will be partnering with The Sullivan Institute for Healthcare Innovation to combine the card with a Blue Button PHR. The goal is to determine if a payer-issued app can finally start to give patients greater access to data. Jopp hopes the project will automate the process to the point that patients will be able to walk into a doctor's office, scan the app, transfer health data into a PHR, and then update the information at checkout. "It's your own information on your own personal device after all," Jopp says. "The difference now vs six to 10 years ago is the smartphone. I'd bet 80% of the population under 40 has one. If we can take a picture of a check to deposit using mobile banking, I'm pretty sure we can do it for a health record." Meanwhile, in response to the Centers for Medicare & Medicaid Services' creation of qualified clinical data registries, a reporting mechanism for the physician quality reporting system (PQRS), the Electronic Healthcare Network Accreditation Commission (EHNAC) plans to develop a data registry accreditation program. Qualified clinical data registries will complete the collection and submission of PQRS quality measures data on behalf of eligible professionals. "We've designed our accreditation program to ensure that provider and patient directory information is available in all the various capabilities that are being developed and managed by exchange organizations," says Lee Barrett, executive director of the EHNAC. Investment in revenue cycle systems is an area that John P. Hoyt, FACHE, FHIMSS, executive vice president of HIMSS Analytics, points to as a focal point for the organization. "The average revenue cycle system of today cannot meet the demands of tomorrow for bundled payments, accountable care organizations, and other payment schemes that hospitals and payers are negotiating to help drive down costs per patient per year," he says. "ICD-10, meaningful use, and platform technologies are all becoming block-and-tackle issues," says Roy Smythe, MD, chief medical officer of AVIA and CEO of HX360, a new joint venture with HIMSS. "The industry will have to deal with all of these in 2015 but none will materially change how health care is delivered." As a result, some experts believe 2015 will be the year when the industry increasingly asks, "Now what?" "It's like stating the obvious that we have to make payroll next week as opposed to asking how we can fundamentally change the environment in which people deliver and receive care," Smythe says. "We're just beginning to see technologies, for instance, that assist hospitals in reducing medication errors where IV infusion is involved," Hoyt adds. "We now have intelligent infusion systems that are interfaced to computerized physician order entry so that the infusion therapy order goes directly to the infusion pump, which is wirelessly connected to the EMR. This eliminates errors in setup of the pump, and it's one of the last areas to get completely automated." "There's a lot to do to make sure health systems and providers are ready for 2015," Jopp says. "For our members, it really comes down to two buckets: what we must do and what we should do." One item in WEDI's must-do bucket revolves around what Jopp calls the rise of innovative encounters in telemedicine. "We're looking at use cases around how we can ensure telemedicine encounters are properly documented for reimbursement. Not just in terms of traditional reimbursement, but also in light of the fee-for-value movement, to ensure quality," he says. The EHNAC will continue to focus resources on a major initiative in Maryland as the state works to ramp up its telemedicine efforts for its constituents. Telemedicine holds great promise to provide convenient patient care while also shifting the model of delivery. "In 2015, we'll see several other states begin their own efforts around telehealth and telemedicine as well in an effort to better serve populations in rural areas," Barrett says. "For many, these initiatives will be the only way to ensure treatment for as many patients and insured individuals as possible with the limited resources and primary care physicians available to serve them." With an aging population, the onus is on providers and vendors to start figuring out how health care data exchange can be accomplished more completely so caregivers are fully equipped to take care of loved ones. For Erin Mackay, associate director of HIT programs for the National Partnership for Women & Families, it's an issue of access. "Access to one's own health information is a right guaranteed to all patients by HIPAA but it's not well understood, even within the provider community," she says. "One of the great potentials for technology is the ability to put that information at the fingertips of patients—particularly as more individuals become caregivers to their children and, increasingly, to their parents as well." Mackay believes data exchange will become increasingly bidirectional in 2015 as patients and physicians begin to share feedback and comments, all with an eye on the end goal of quality data and continuity of care supported by IT. "Right now, a huge missing piece is outcome. Did the patient get better? Did the antibiotics work? We need the ability for patients to share data back and forth and, when appropriate, have that incorporated into their electronic medical records," she says. Wearables are likely to play a key role in any patient-generated data strategy. However, whether the information culled from these devices is of much use to physicians is up for debate. While consumers may be thrilled by the ability of wearables to capture health data, physicians are more likely to take a jaundiced view of their output. For many consumers, becoming an active participant in their own care takes getting used to. "It's not something that all of a sudden someone flips a switch and turns on a light from not wanting to be an active steward of one's own health information to being fully engaged," says Christina Thielst, a hospital administrator, health care consultant, and author. "For the World War II era, the Greatest Generation, they didn't need or want control over their health information because whatever the doctor said or suggested was fine by them. Baby boomers, on the other hand, question authority a bit more, and subsequent generations even more so. "Particularly in the United States, we have a tendency to be all over the latest and greatest but that often means we set a New Year's resolution, pick an app to help us get there, and then when it's beach season, we wonder why we still can't fit into our bathing suits," she continues. "I hope that more consumers recognize their role on the health care team and the important voice they represent. If they see or hear something that doesn't seem right, I hope 2015 will be the year they speak up and actively engage with their providers." To reach that point in care delivery, Hoyt says connecting consumer engagement tools to EMRs—whether that's in a hospital, a large integrated delivery network, or a solo physician practice setting—would be a huge step. "Some stage 7 clients have shown some exciting improvements, including one organization that gave away Bluetooth-enabled weigh scales so that congestive heart failure patients could send daily weights to their EMR," he says. "That organization showed a 42% reduction in the readmission rate of that population over 12 months. And a pediatric organization showed an 11% decrease in obese teenagers through engaging them in competitive reporting of steps per day from Fitbits, which they gave out to hundreds of teenagers in their market." The success of such consumer engagement tools may rest with the FDA's ability to keep up with the flood of mobile health applications, which are entering the market at a rate that far outpaces the agency's ability to regulate them. Plus, the emerging tools simply may not gain widespread appeal. "For all the value of technology, it's simply not going to work for everyone," Mackay says. "Some information will get lost in translation—that's where data quality and integrity come in—and sometimes consumers may just not be comfortable having all of their health information digitized or they may prefer a more visual representation like an infographic. Technology enables us to make this possible in whatever form that takes." Meanwhile, technology giants figure to make more health care headlines in 2015, a development Mackay applauds. "The positive aspect of big players like Apple and Google entering the health care space is that they bring more attention to the issues at hand while also demonstrating the demand and the need for greater patient engagement tools as doctors become increasingly accountable for patient outcomes," she says. The same phenomenon is occurring in the remote patient monitoring world, according to Kent Dicks, CEO of Alere Connect. "Big companies that come in, like AT&T, Qualcomm, or Samsung, are looking for things in large volume, small margins," he says. "This industry has the ability to produce large volume—millions who need to be monitored, cared for, and connected [but] efficacy is not taking off. …The industry has to evolve and it's not happening quickly enough for big telecom companies and device manufacturers who need to achieve results with larger volumes in an area where margins are typically small." Apple and AT&T aren't the only big names making waves. In August, EHR giant Cerner purchased the HIT business of Siemens for $1.3 billion, a move Work believes bodes well for the parent company. "Cerner's acquisition of Siemens represents an example of the mergers that will, I believe, continue to happen in 2015," he says. "What's in it for Cerner is a very large installed base of Siemens clients into which they can sell their Cerner solutions. That's important because most hospitals have already purchased their big clinical systems and EHRs so it's an opportunity to further consolidate." In terms of available investment dollars for new technologies, many hospitals are struggling as they strive to become more efficient while balancing issues such as privacy, security, and compliance. The challenge becomes when and how to research and purchase new services and solutions. In 2015, Work believes hospitals may have fewer options to choose from as mergers, acquisitions, and bankruptcies continue to reduce the field. On the flip side, this may lead to greater competition and more favorable pricing. The federal government's renewed focus on interoperability is likely to be a hot-button issue during the coming year. Organizations such as the Healthcare Services Platform Consortium, a group backed by Intermountain Healthcare, the VA, Harris Healthcare Solutions, and others, are bound to come to the forefront in an effort to advance the prospect of building a services architecture foundation. Whether interoperability becomes more feasible during the course of 2015 is open for debate. However, there's no argument that when it comes to innovation, the year holds great promise. — Amanda Griffith is a public relations consultant and freelance writer in southeastern Massachusetts.